It’s time to introduce an Open Color Ecosystem. Let me explain. Our industry is ready for an Open Color Ecosystem, which the entire industry helps build and maintain so that we can demystify color; not only for ourselves but for the entire color supply chain. No one person or business can or should have a stranglehold on color information. This just makes it more difficult for most supply chain participants to do their work while one entity profits from the difficulties it creates. Sure businesses can and should own ways to name and classify colors. However, we think those classification systems should be as close to free and open as possible. After all, nature created all the colors in the world, not man. Those who formulate inks and other colorants are also entitled to a return on their investment. I’ve seen what goes into producing inks and pigments. For example, it’s quite easy to burn through a million dollars or more developing a new ink set that is deemed safe for use in food packaging. However, an entity should not “own” the color red. Instead they should own a way of naming a specific red and a way of producing that red for use on food packaging. There are businesses that build and maintain systems to distribute color information (as we do). Color distribution systems are important because they enable quick and easy (ideally even transparent) access to color information up and down the supply chain. As you might expect, we feel businesses of this nature are also entitled to a return on their investment. There are businesses that design, develop and manufacture instruments to measure color. While in theory all instruments should measure color exactly the same way, the reality of it is that they don’t. For example, the chart below shows the measurements of hundreds of different color swatches made by two spectrophotometers from different manufacturers intended for the graphic arts use. The measurements were made on the same day in the same room by the same people. 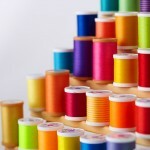 Because instruments are manufactured in different ways (while still adhering to international standards), these differences are to be expected but they do create issues with the free and open sharing of the measured values of the colors by all needing to keep the color supply chain rolling along. So we created an innovative software called Normalizer to minimize the manufacturing differences between instruments of multiple manufacturers. This next chart is the same set of measurements as above but run through Normalizer to make one of the instruments approximate the measurements of the other. The above numbers are just our starting point; Version 1.0 if you will. We are already working on ways to improve upon these results and will keep you posted. Also, consider that a tool like Normalizer can eliminate the need to create multiple ink drawdowns that must then be distributed to multiple printing plants. You gain the advantage of not requiring a printing plant to purchase a specific instrument (raising their operation costs) as well as cost and time savings of shipping color swatches to all the plants that print your work. A true Open Color Ecosystem requires that the supply chain own the colors and be able to distribute them to other supply chain members in clear and meaningful ways even if the same instrumentation will not be used to measure color throughout the process. Normalizer is a key piece of technology that will enable this to exist. What other tools do you think an Open Color Ecosystem needs?